Henry Wynne of Westport runs during the Pequot Thanksgiving Day Race. Wynne finished first with a time of 24:50. SOUTHPORT—The weather was nearly ideal for the more than 3,600 runners, less so for the more than 500 walkers and many spectators. 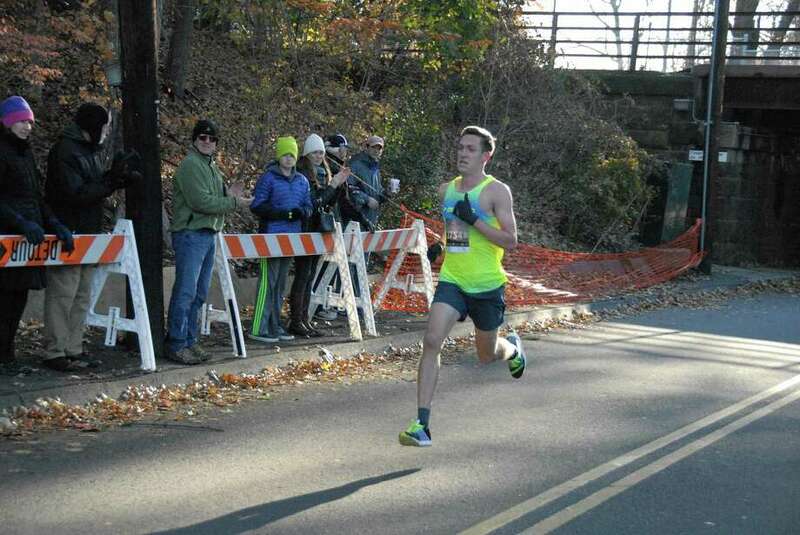 For the men, Henry Wynne’s (Westport) 24:50 time was just four seconds faster than Spencer Brown (Wilton). For the women Habling Abing’s (Boston) 28:53 time beat Jamie Morgensters (Atlanta) by more than a minute. Neither winning time set long standing records for the course. Once again Mary Zengo (Wilton) turned in an amazing time (30:39) for a woman over 50. The race, one of the oldest and largest in Connecticut is co-sponsored by Southport Family Dental, Darien Rowayton Bank, ASF Outdoors of Westport, Rocco & Associates Wealth Management, Cohen & Wolf, Poland Spring Water, Cycle Dynamics, Trinity Episcopal Church, Southport Congregational Church and Fred’s Car Wash. Beneficiaries of the race include Wakeman Boys/Girls Club of Southport, Westport EMS, the Domestic Violence Crisis Center, Fairfield Counseling Services , the Laddie Lawrence Scholarship Fund (founded by the Pequot Running Club) at Staples High School in Westport, The Fairfield Museum, The Pequot Library, Westport EMS, Bridgeport Junior Achievement and the Fairfield Police Explorers. 9. Peter Kreuch 21 27:17; 13. Daniel Lennox 37 27:38; 25. Griffin Ott 17 28:49; 30. Alex Ostberg 20 28:58; 35. Ed Banks 50 29:25; 65. Sebastian Devereux 22 30:43; 88. Liz Herbert 49 31:50; 108. Arthur Cassidy 21 32:22; 152. Robby Waters 20 33:31; 185. Alex Cotter 39 34:16; 193. Ray Buxton 50 34:24; 242. Colten Appleby 21 35:13; 335. Johannes Kruse 22 36:46; 355. Meredith Ott 23 36:58; 387. Marley Garfield 16 37:22; 393. Cameron Appleby 16 37:24; 445. Mark Desautelle 50 37:54; 448. Doug Schiff 47 37:56; 518. David William Morgan 39 38:34; 560. Joshua Smith 47 39:01; 561. Jake Smith 14 39:01; 564. Jonathan Ballard 25 39:01; 628. Wendy Bass 42 39:37; 631. Kevin Lloyd 65 39:39; 666. Sean Mulrenan 35 39:53; 684. Kristin Desautelle 50 40:05; 694. Shu Lee 46 40:07; 697. Caroline Ostrand Ostr 20 40:09; 807. Gavin Hall 22 41:12; 816. Alex Aparicio 22 41:16; 848. Lindsay McGuinn 36 41:33; 889. Janeen Eckert 47 41:47; 1086. Sophie Petti 13 43:07; 1134. Joseph Perry 40 43:22; 1196. Christopher Monsif 35 43:47; 1199. Moriah Monsif 34 43:48; 1202. David Eagle 41 43:49; 1209. Pablo Martinez 19 43:50; 1243. David Short 56 44:02; 1378. Carly Dudzik 27 44:49; 1417. John Huntington 40 45:03; 1423. Caylee Waters 22 45:05; 1424. Paige Ballard 20 45:05; 1446. Gayle Appleby 53 45:11; 1470. Will Morgan 15 45:18; 1472. Matt Sealy 20 45:20; 1863. Devon Eagle 38 47:27; 1957. Laurie McGrath 70 47:57; 2044. Amy Dunkin 44 48:26; 2052. Amy O’Reilly Rizzi 44 48:27; 2073. Corey Kilcourse 36 48:33; 2098. Justine Stewart 46 48:40; 2141. Mark Mirsky 49 48:56; 2279. Sam The Bam Sealy 13 49:41; 2286. Dave Sealy 51 49:43; 2345. Margaret Von Rieseman 50 50:06; 2349. Olga Papaeconomou 20 50:07; 2351. Lambros Papaeconomou 51 50:08; 2511. Charlie Imbrogno 10 51:04; 2514. Jake Miller 10 51:05; 2566. John Lopat 66 51:26; 2578. Henry Imbrogno 12 51:29; 2732. Yee Lin 43 52:27; 2754. Andrew Morgan 21 52:35; 2755. Catie Morgan 18 52:35; 2840. Alexandra Castro 54 53:12; 2889. Tom McGrath 73 53:38; 2996. Carrie Bernier 47 54:33; 3111. Marie Morgan 46 55:55; 3209. Sarah Knowlton 23 56:59; 3210. Ben Lowden 24 56:59; 3501. Ronald Wedeking 62 1:03:05; 3591. Kylie Morgan 17 1:08:38. 122. Robert Dillon 36 32:55; 129. Declan O’Connor 20 33:01; 160. Brett Wilderman 40 33:40; 162. Charled McEnany 20 33:41; 179. Elizabeth Perry 21 34:07; 191. Ike Groff 48 34:20; 228. Mark Kerchoff 36 35:01; 266. Douglas Parker 49 35:45; 285. Jack Johnson 14 36:02; 307. John Dunn 52 36:23; 336. Lisa Tuffy 51 36:46; 345. Ben Burns 17 36:51; 347. Jeff Johnson 45 36:52; 397. Brendan Sweeney 20 37:28; 402. Lindsay Meyer 32 37:29; 430. Jack Wolpers 12 37:48; 433. Corliss Spencer 56 37:49; 524. Luke Riley 15 38:38; 576. Caroline Murray 24 39:07; 742. Chris Glover 37 40:39; 825. Emilie Rubinfeld 44 41:20; 827. Amanda Dobbyn 24 41:22; 831. Paula Muller 46 41:23; 851. Svetlin Tchakarov 41 41:33; 893. Mason Dorman 14 41:48; 974. Irving Dorman 12 42:22; 981. Mark Dorman 47 42:24; 988. Ashley Wolpers 14 42:26; 1197. Emily Burns 48 43:47; 1259. Ivan Nedeltchev 37 44:10; 1384. Lloyd O’Connor 60 44:50; 1430. James Riley 57 45:07; 1576. Kristen O’Connor 54 45:52; 1662. Dana Perry 56 46:16; 1749. Jen Kerchoff 39 46:48; 1755. Erin Graves 35 46:50; 1765. Urszula Dojnikowska 30 46:52; 1895. Heather Buscher 35 47:35; 1930. Krista Murphy 41 47:47; 2373. Carissa Marz 39 50:17; 2441. Clark Murray 62 50:38; 2757. Jackson Zylick 10 52:36; 2865. Michael Buscher 66 53:19; 3181. Annabelle Murphy 11 56:39; 3213. Christian Murphy 48 57:01; 3260. Semia Zylick 8 57:34; 3265. Justin Zylick 38 57:34; 3311. Kerinne O’Connor 22 58:18; 3323. Michael Holland 73 58:25; 3324. Joan Jaworowski 83 58:28; 3328. Suzanne Green 61 58:30; 3335. Katarina Tchakarov 38 58:39; 3425. Colm Dobbyn 56 1:01:07; 3459. Oliver Tchakarov 12 1:01:52; 3487. Dominika Dojnikowski 17 1:02:36; 3541. Simon Tchakarov 10 1:05:11.